Who doesn’t love a big closet? I know I do. 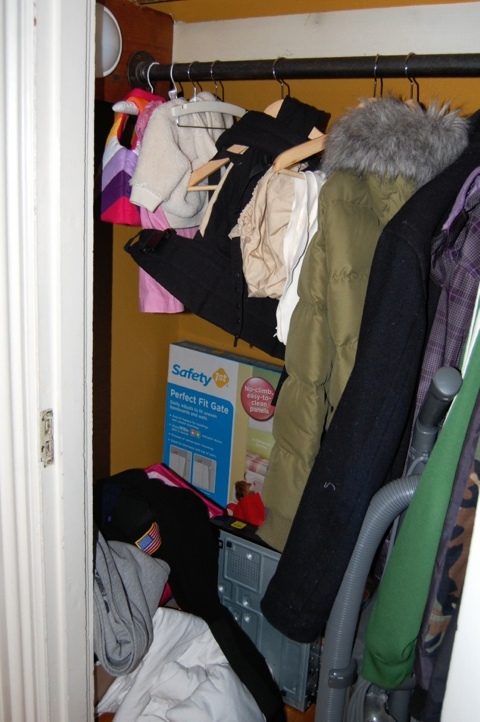 We have a large closet in our living room that I was very glad for when we moved in here. Unfortunately, I never showed my true appreciation for it. It became that catch-all that everyone has in their house (admit it). 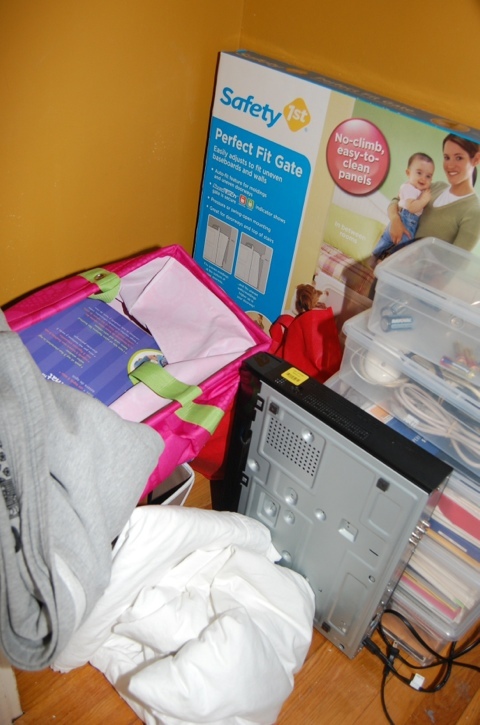 It held of the things one would expect: coats, extra blankets, the vacuum cleaner, etc. it also held some really random things: baby shower gifts we weren’t using yet, bins of batteries and cords, old cards that I love to keep, an old DVD player that needs to be thrown away after Andre retrieves the DVD that is stuck in it, boxes of clothes that need to be brought for consignment, and the like. So, we invested in a cube shelf from Target. We got the 9-cube shelf thinking we could use some for storage and some for Eila’s toys as she accumulates them. One fateful morning, I decided to put it together. Eila was totally content watching me, and it only took about 30 minutes. Then, I cleared out the closet and ceremoniously slid the shelf into place. And lest you think we didn’t measure beforehand this time, we did. We just didn’t take into account (yet again) our very crooked walls. The one spot I measured yielded enough space, but apparently one wall tapers a bit and no matter what I did, I could not get it to fit. So the 9-cube shelf is currently sitting in our living room (more clutter- ironically annoying considering the ponit of the William Morris Project) in hopes that we can sell it. We went back and bought a 6-cube shelf. it fit with some room to spare. I’m bummed that I don’t have as much storage as I had originally planned. but it sure is nice to to have a pile of stuff on the closet floor. I won’t leave the shelves like this forever. Once I clear out the other side of the closet (it’s full of clothes for consignment) I will move those plastic boxes and a few other things over there and add some canvas bins for Eila’s toys. Not a very glamorous project this week, but at least I don’t shudder every time I open the closet door. 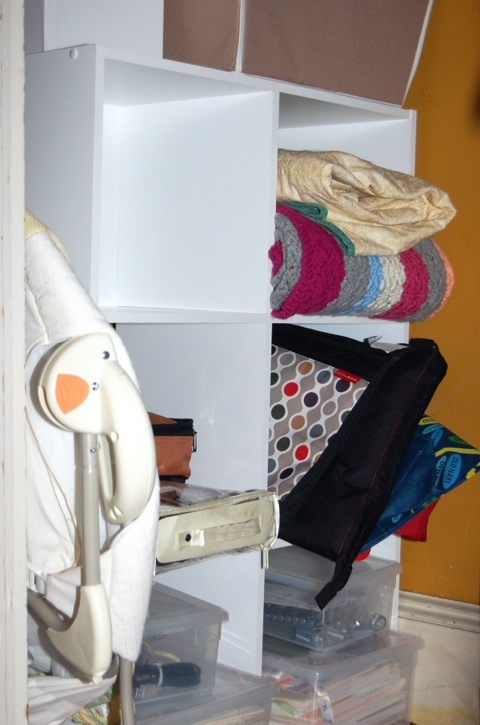 The piles of stuff were not beautiful, and this storage is definitely much more useful. I’m linking up over at Pancakes and French Fries and cant wait to check out everyone else’s projects! Its not glamorous, but its nice to have the space back! Its looking good. Crooked walls are the worst! It sure is nice that you have big closets though! 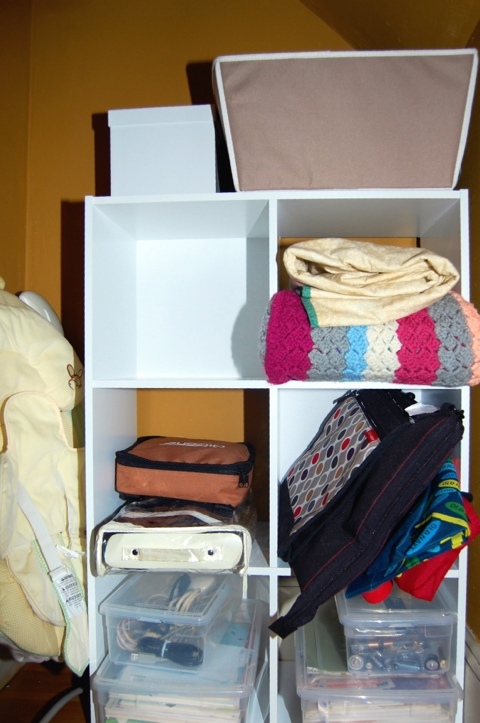 Having just moved out of a house with the smallest closets you have ever seen, anything else seems luxurious! It is hard not to just keep everything though! So true. I’m really trying to be mindful of what we hold on to and what we can let go. This is the kind of project where you feel so good when it is done! So good! I really do. I no longer get annoyed every time I open the closet door. So good! Bummer about the bigger shelf not fitting, but it’s nice that you have such a large closet! And the 6 cube storage DOES make a difference. Baby steps. I just cleaned out a closet too and all I can say is, why didn’t I do that sooner? 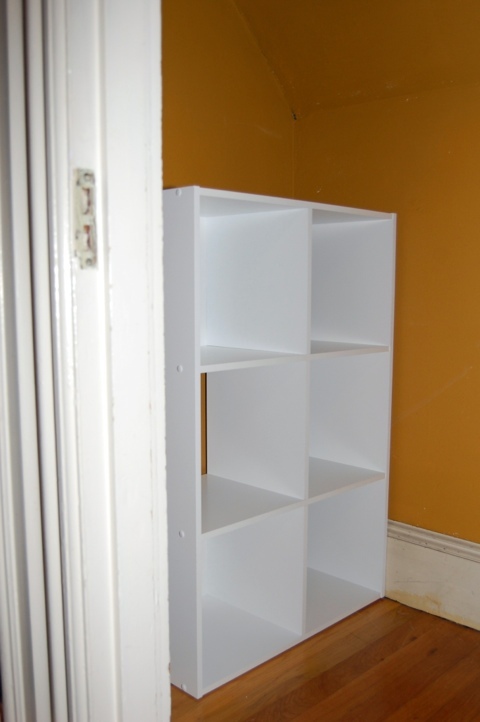 Bummer about your 9-cube cubby; would that not make awesome storage in your baby girl’s room or elsewhere? And PS, your baby girl is.so.scrumptious! Her room unfortunately has very little wall space thanks to 2 doors and an entire wall of windows. There is a chance we can put it in our back hallway for extra food, paper goods, etc. I really hope it works! It does feel good to have things off the floor. Seeing them will make it easier to deal with them too, like the consignment clothes. 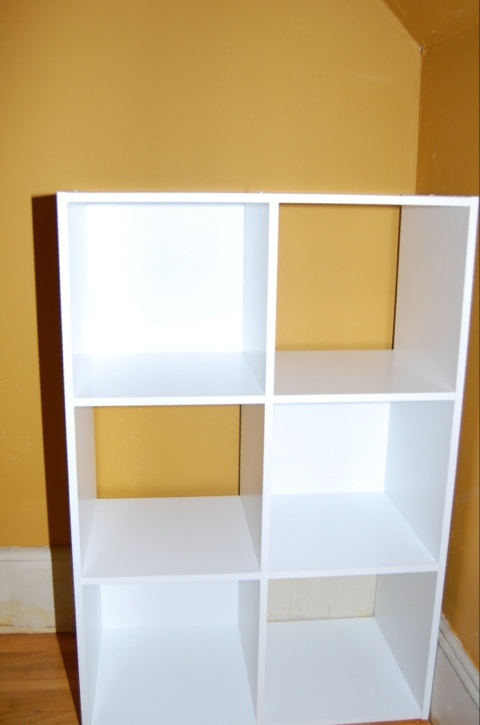 Sorry that you had the headache of the wonky walls, but glad you were able to make a solution with the 6 cubed shelf. It looks great! Thanks for sharing your project! Thanks Lais. I’m so excited to get those clothes out of here!